A herb that is indigenous to Britain, White Horehound grows freely in Suffolk and Norfolk, among other places. Famed for its healing properties when it comes to coughs and other respiratory ailments, it is often used as a chief ingredient in many herbal expectorants and tonics. Horehound used to be used in cough lozenges in the UK, but was banned in 1989 over questions concerning its efficacy. It is still widely used in Europe as a substance to remove phlegm from the lungs, and many European cough remedies that are popular here, such as Ricola, contain Horehound as a chief ingredient. Known by the botanical name Marrubium vulgare, White Horehound is plentiful, as it grows freely along wastelands, roads etc. A bushy herb, it was popular among the ancient Greeks and Romans as well as many indigenous peoples, such as Australian Aborigines and Native Americans. It is also used to make the non-alcoholic Horehound Ale. A perennial herb, many herbalists find White Horehound more effective at removing mucous than even Coltsfoot, as drinking just one cup of tea made from it can loosen phlegm accumulation. It is also touted as a well-known remedy to help headaches, especially those caused by sinus problems and congestion. Some proponents of this herb also recommend it to alleviate symptoms or bronchitis, asthma and whooping cough in children. Interestingly, this herb is also used to treat intestinal worms, soothe shingles and eczema, and as an appetite stimulator. And despite the fact that some sensitive people get a rash when touching it – those who are allergic to mint, for example - Horehound is still used as a popular flavouring for certain types of old-fashioned sweets. 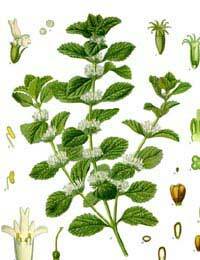 Boiled sweets made from Horehound are manufactured by boiling the minty leaves of the plant with loads of sugar. In places such as the United States, cough sweets made from Horehound are commonplace, with their own distinctive flavour. The jury is still out when it comes to the efficacy of White Horehound, as mentioned. While there is a lack of clinical evidence to support its overall use, a German panel has approved it to treat mild heartburn and lack of appetite. It has also been reported to cause low blood sugar, low blood pressure and abnormal heart rhythms on animals, so proceed with caution. People who are allergic to mint should avoid White Horehound, as well as people with stomach problems or heart disease. In some trials it has also been shown to cause diarrhoea and vomiting as well as rashes. Avoid White Horehound also if you are pregnant or breastfeeding, and it may interfere with other cold medications or expectorants, making them even more effective. It can also reduce the efficacy of migraine medications and some anti-depressants. And don’t confuse it with Water Horehound or Black Horehound, which are completely different. As always, check with your GP before taking any type of supplement, even a herbal one. It’s always better to be safe than sorry, even when it comes to something that’s 100 percent natural.